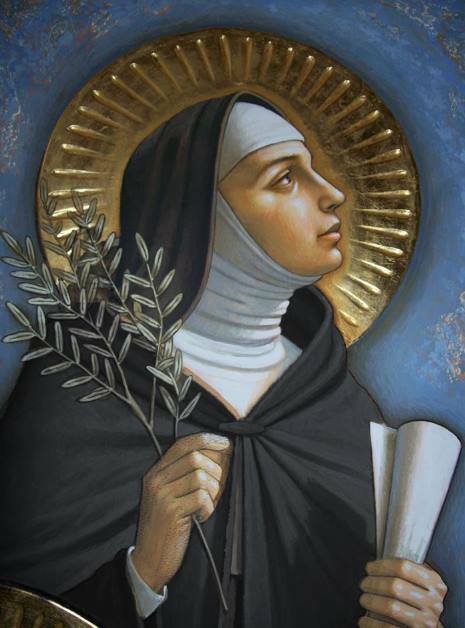 St. Clare of Assisi is the founder of the Order of Poor Clares, whose brown-attire nuns devote their lives to prayer, poverty, mortification and manual labor. Filipino faithful have a special devotion to St. Clare, one of the first followers of St. Francis of Assisi. Her two monasteries – Monasterio de Sta Clara in Quezon City and Monastery of Poor Clare of Blessed Sacrament in Laguna – draw pilgrims and devotees who offer prayers, gifts, mostly eggs, for special intentions, and join street dancing. At the San Pascual Baylon Parish (Obando Church) in Obando, Bulacan, where the Italian saint is venerated as one of the town’s three patron saints and where childless couples traditionally dance the “pandanggo” in May during the fertility fiesta, a special mass and a procession are traditionally held on her feast day. Eggs will also be offered before her image to pray for good weather. A popular pilgrim site, the Basilica of St. Clare, built atop a hill in Assisi, Italy, in 1260, houses her remains which lie beneath the high altar.